When I was thinking about all the different kinds of beds I could make for E. My main goal was to reuse as much as possible. I already have 3 bed frames in my garage and I did not want anymore. I had this vision of reusing the box spring. 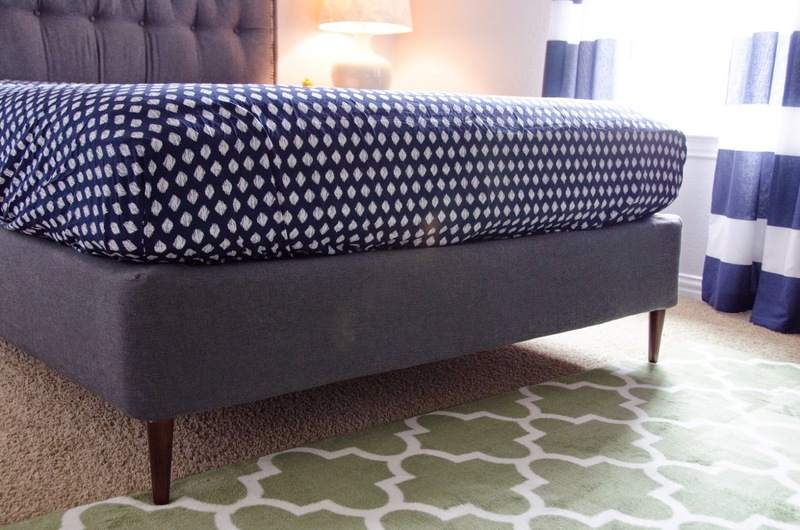 I figured reupholstering it and adding legs could turn it into a platform bed. This is how it turned out. I can't say how much I love this bed. I've made every bed in my home and I think this is my all time favorite. This bed was a pure calibration between E. and I and that made it super special. I started out shopping for fabric. These were our top three choices. I like the top right one the most, but we only 3.5 yards, I didn't think we had enough so we went with the bottom gray. Here's E.'s box spring. I removed the corner plastic protectors for a clean finish. Next, I wrapped the fabric all around the box spring because I did not want a single seam. I cut the fabric 4-5 inches from the edge. I pinned and stitched the corners together. I originally planned to sew the fabric right to the box spring. However, after a few stitches and some throbbing fingers, I decided this plan was definitely a no go. 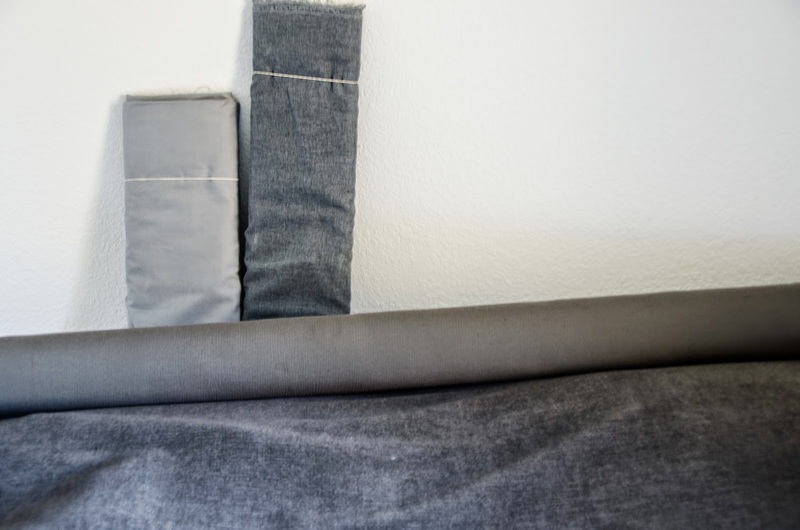 I searched through my fabric remnants and found a piece that was nearly the exact size of the box spring so I decided to sew that piece of fabric together with my gray fabric. After sewing all around, I flipped the right side out. I laid it over the box spring and stapled it into place. Next, it was time to pick out some legs. Traditional? Nope. How about mid century? Yes! However, they were too tiny in diameter to support my bed. So I ordered these babies. These are 6 inch mid century legs. I love them, but since they were a little pricey, I didn't purchase them for 3 weeks. Now it was time to attach them to the bed. 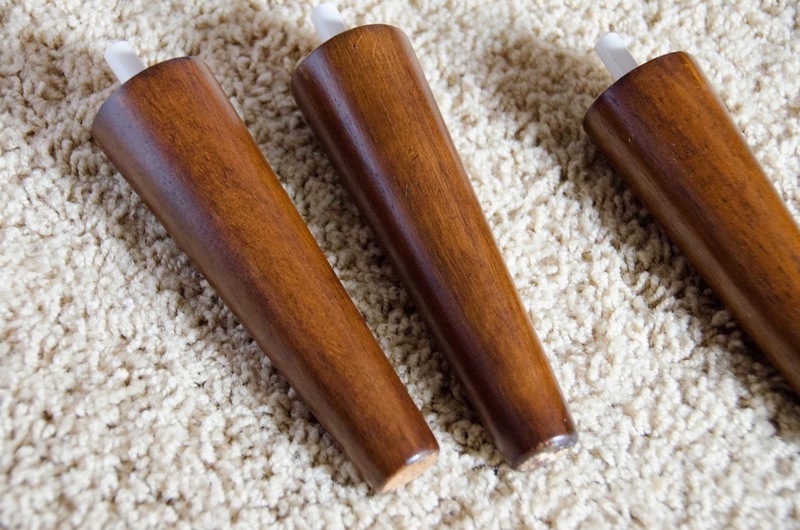 I used these furniture leg plates I found at the hardware store. In the midst of the 3 week wait, I decided to change the fabric on the box spring again. I went with my first choice (the fabric that I only had 3.5 yards of). I made it work with a seam on each side of the box spring. I know I didn't want a seam, but I loved the fabric too much. I barely notice the seam so I'm happy with the choice. Just love the linen look. Back to the bed legs. 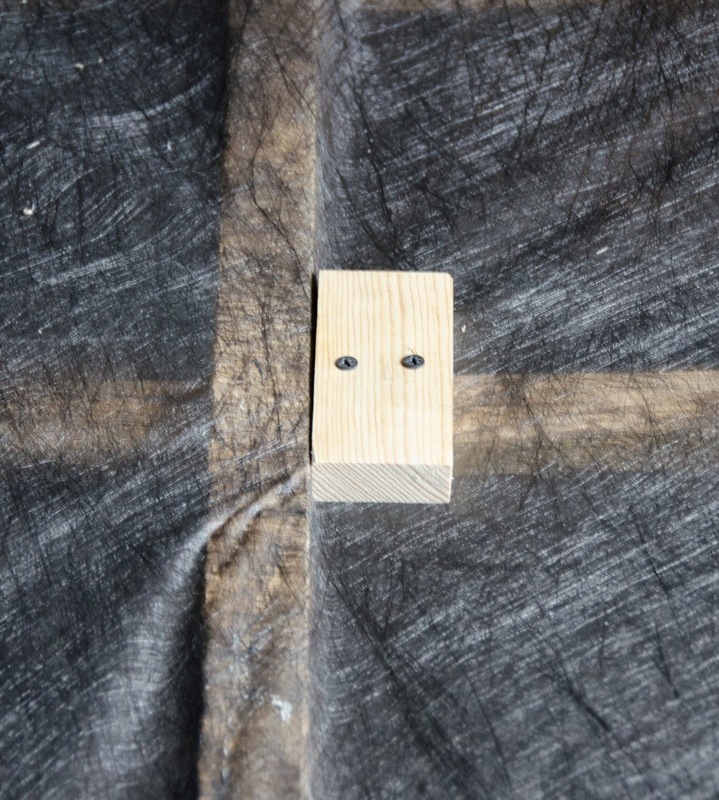 I cut the fabric where the screws were going to be and then predrilled some holes. I then screwed the plate in place. Easy peesy. Next, I attached the legs. I already love it. I decided to buy some glides for the bottom of the leg so that it would protect the wood at the same time allowing me to push the bed into place. I added some supports to the center of the box spring as well. Since I didn't have enough wood to attach the leg plate, I added a scrap piece of wood. Here are all the leg placements. The center legs are different because I didn't want to splurge on mid century legs that wouldn't be seen. Instead I got the cheapest 6 inch legs I could find. After flipping the box spring over, I get my semi-mid century bed. Therefore, I hammered the trim into place. We started with this setup when E. moved into his new room last month. 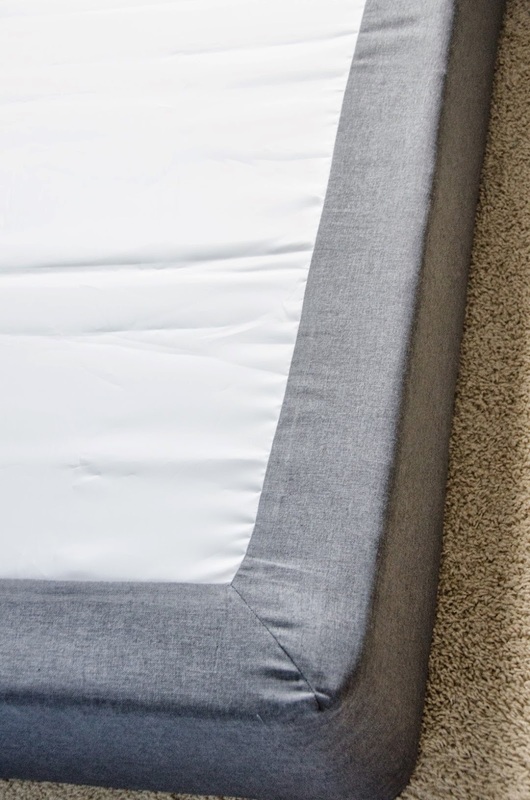 A mattress sitting on a box spring which sat on the floor. E.'s reaction was, "this is SOOO awesome Mom. I love it." I love it too! I love every bit of it. I also made the head board. You can find the tutorial here. 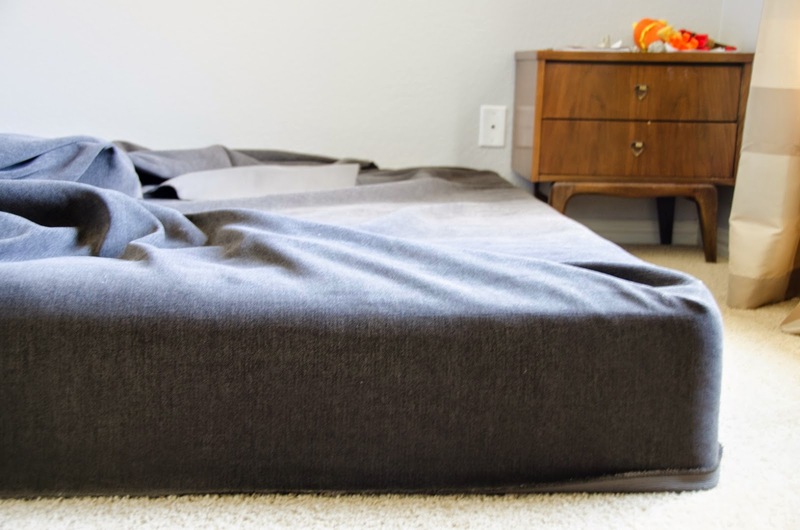 The final total cost of the complete bed is $122.17. That's a little more than what I anticipated on spending, but I find the areas that I did splurge (nail head and bed legs) to be completely worth it because in the end, there is nothing I would change about the bed because I simply love it. 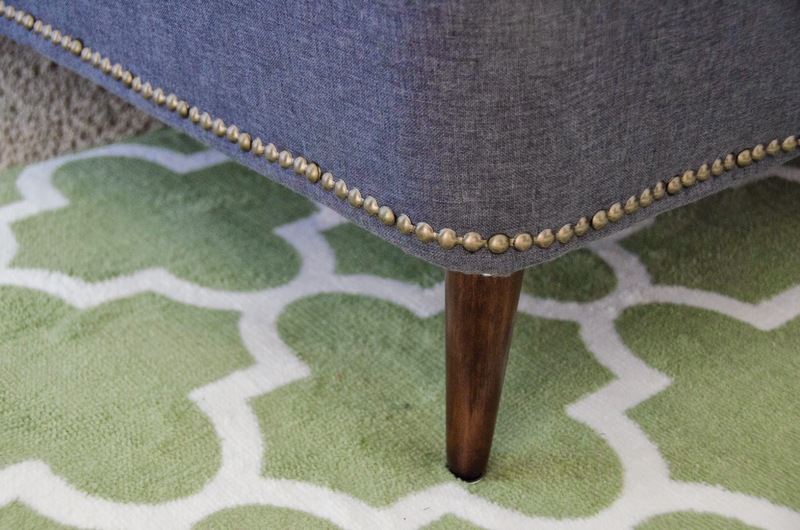 Nailhead trim direct from the manufacturer. I bought the #5 French Natural Nailhead Trim. You can also get this. 6 inch tapered Mid Century Furniture Legs were bought here or some look alikes here. Square Furniture Legs for the center of the bed and Leg Plates were bought here. All the bedding was bought from Target except for the grey quilt which is West Elm's Frayed Edge Quilt. The striped shams were taken from a duvet set which I converted into the striped curtains you see. Tutorial for that can be read here. The green pillows, throw and rug were also purchased from Target. Bed is done, now we need some artwork on the wall. Once we tackle that, we will face the other side of the bedroom. I can't wait! The room is slowly coming together. I absolutely love what you and E did!!! I'd pay top dollar for that! This is a great tutorial, but I am a rank beginner and have a question about the legs. 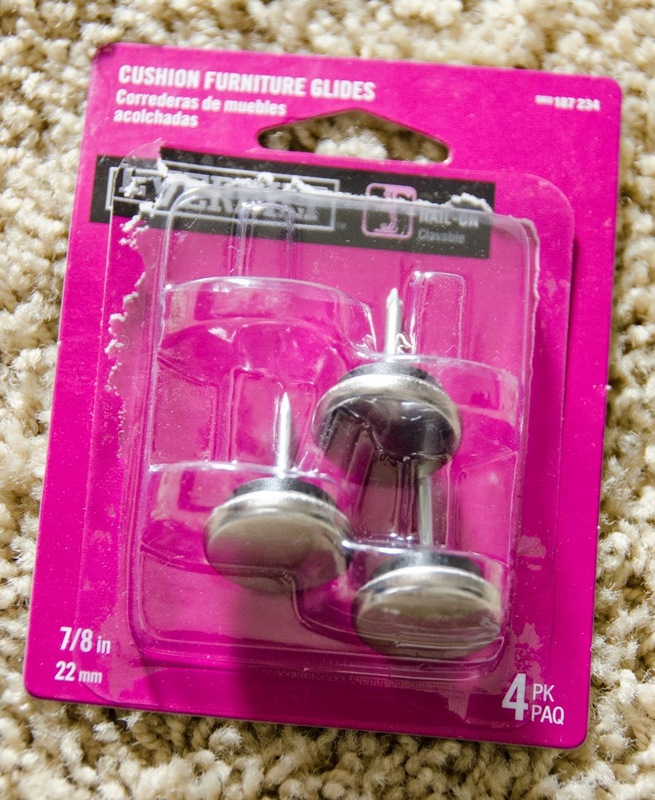 I've found some online that I like, and they come with the "hanger bolt" hardware already installed. Trouble is, I don't know how to use it properly. Supposedly, the screw on the legs I like protrudes about 1-1/2" from the legs. I believe from looking at the mounting plates in Lowes and Home Depot that this is too long. The legs they sold there certainly had screws that were shorter than 1-1/2"...I'm guessing about 3/4" protruded. And it looked like the mounting plates would only accept about that much length. As I mentioned, I'm a rank beginner, and don't know what my next move should be. Ask If I can get a shorter screw? Or what? I didn't like any of the legs Home Depot had. Do you use these things with a nut? If so, how? Some pictures of that particular step would really help people like me who don't know jack! 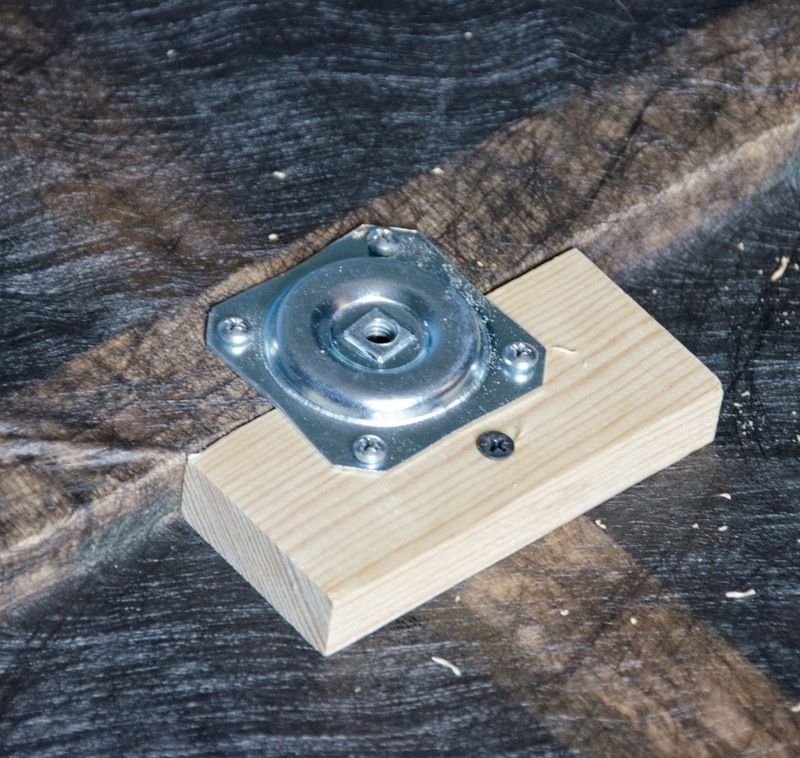 If you are screwing the legs into wood and it doesn't matter if the screw goes through the furniture, then it doesn't matter too much if the hanger bolt is longer than the plate. 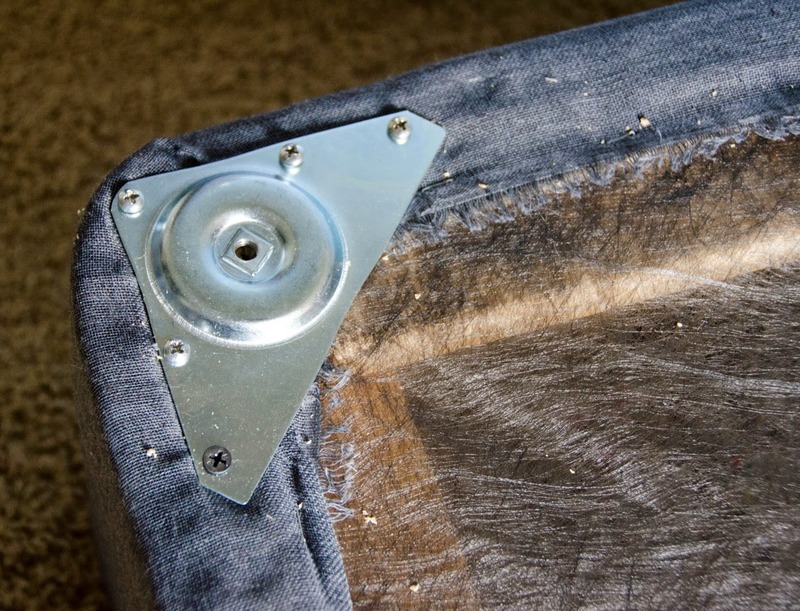 You will have to pre-drill a hole into the furniture so the hanger bolt has some where to go. 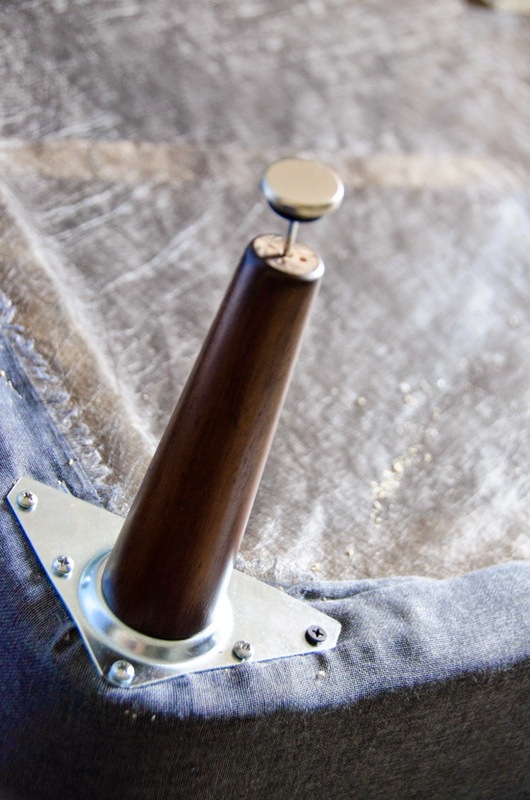 If you custom order legs, they will make the hanger bolt as long as you want. Mine did end up being longer than the plate so I just screwed it directly into the box spring which I thought made it more stable. 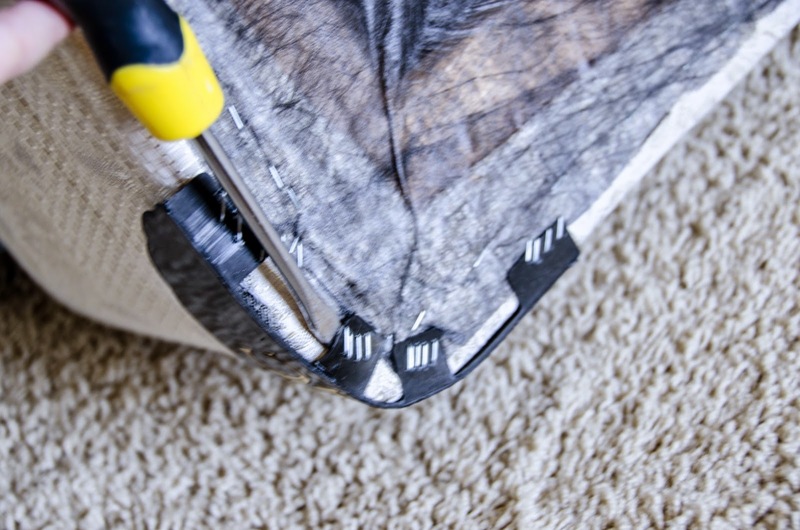 If you use the nut to attach the hanger bolt, you will need access on both sides of the screw in order to attach it because it will need to be tightened from the bottom as well as the top. This was not an option for me as I did not have access to the other side. I hope that helps. Good luck! This is exactly what I was looking for. I have researched it for ages and couldn't find anyone that had already attempted my idea. It looks great and I will be starting my own now, thanks to you. Perfect! 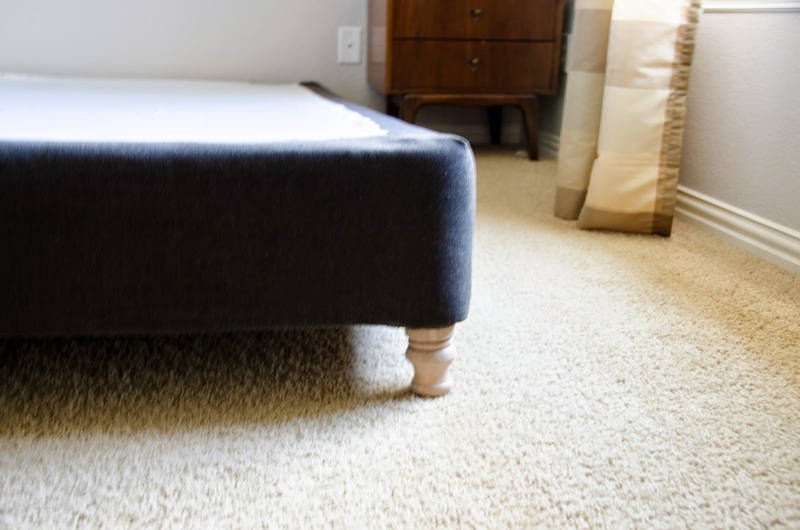 How did you attach the headboard to the covered box spring? We have a similar set up but we have the bed pushing the headboard up against a wall. I'm trying to figure out how to attach the headboard directly to the box spring. I'd love to know how you've set yours up. For this particular bed (because the mattress and box spring combined are so high), I do not have the headboard connected to the bed. It is pushed to the wall by the mattress and box spring. Since my mattress height is half the height of the headboard, it hasn't budged. If you are worried, I have also used wall cleats before. You can buy them at any hardware store or even at target where you hang one horizontal cleat on the wall and another on the headboard. The headboard would then "hang" on the cleat attached to the wall. 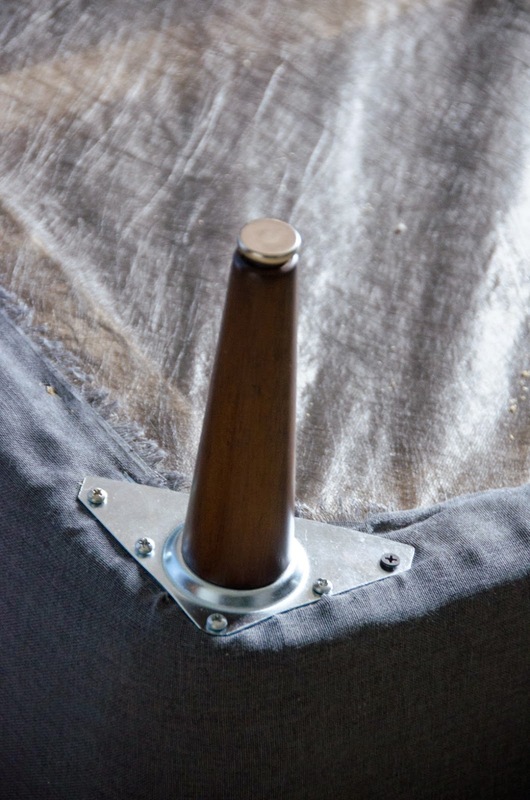 That would be a more secure way to fasten the headboard to the wall if you could not attach it to a frame. I love this bed just what I was looking for and so cheap!!!! I am going to have fun making this bed!!! I hope you try it and let me know how it turns out! Btw! Where did you get such inexpensive fabric? Okay, this might be a silly question, but I do not see (like, at all), so I'm just a little confused on one step. 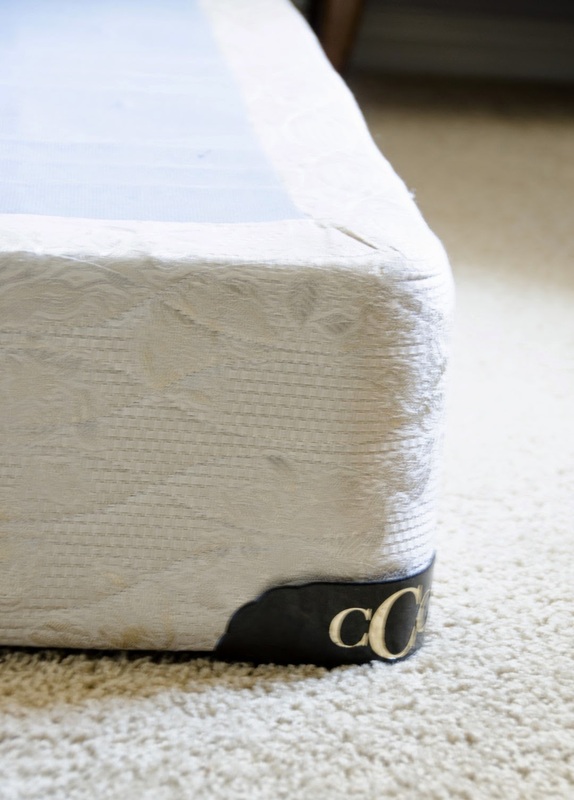 When you pinch and sew the corners for the box spring, you actually have the wrong side laying up, correct? That way you just flip it over and staple it to the underside? Thanks for your help! I've been waiting with the materials for awhile to do this to my bed! Not a silly question at all! Yes, I have the wrong side facing up when pinning everything. My fabric looked right side up even when it was wrong side up! After you sew it, you would, like you say, flip it around and staple down. Love this! My only question is do you think this would support two people that weigh 130 and 160? I think this would depend on your box spring. I've seen some box springs that are constructed of metal and I think it would support multiple people if that were the case. 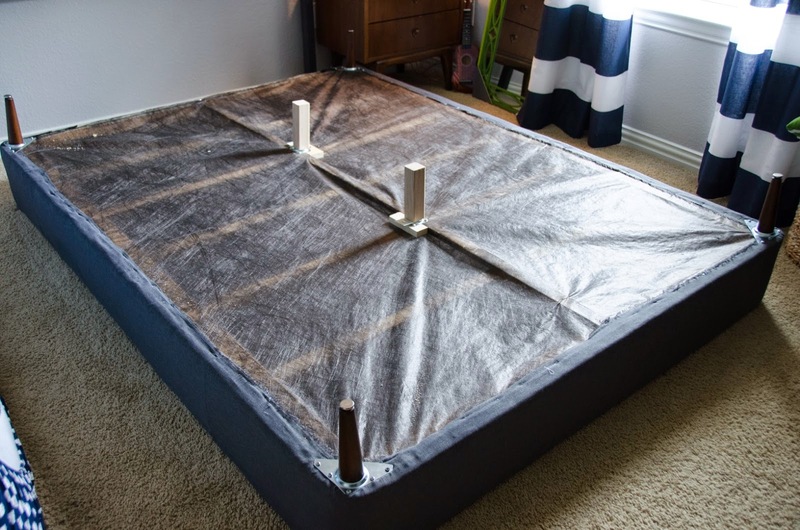 If it is made entirely of wood like mine is, I would reinforce the box spring underneath by screwing some wooden supports that run the length of the bed. 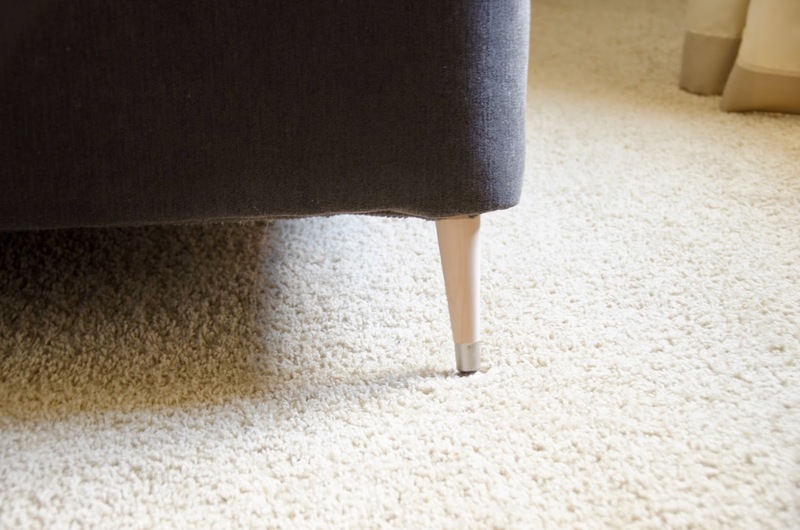 I would also purchase additional legs to add in the middle edge to distribute the weight. I hope that helps. However, please note that I'm not an expert and this is merely an opinion of what I would do. Love the tutorial. 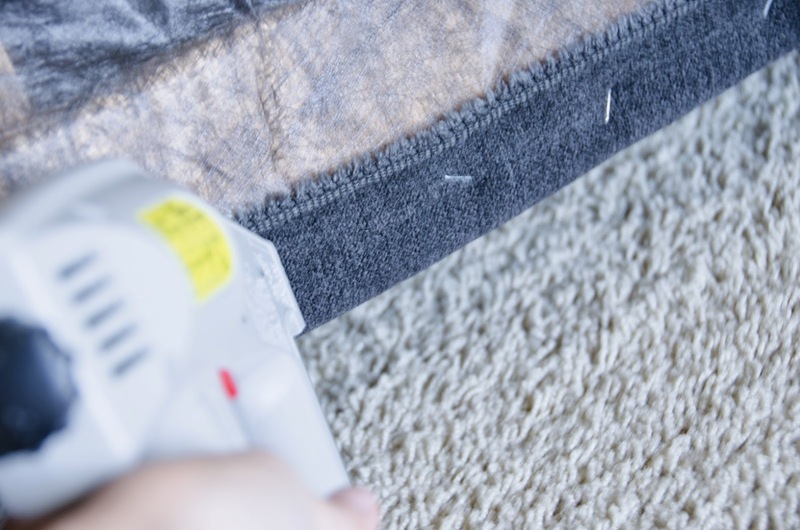 How do you attach the bed head to the boxspring securely? 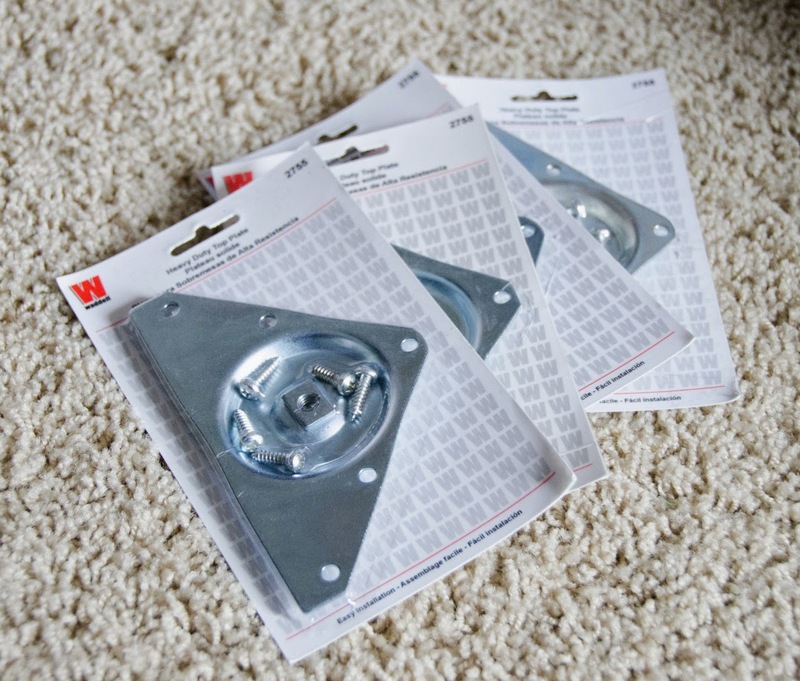 I looked into wall mounting and cleats. The majority of tutorials feature screwing the bed head legs into the frame but I'm not too sure if the box springs will hold the weight? Mel, you can definitely use wall mounting cleats. I have done this before on another bed and it works great! 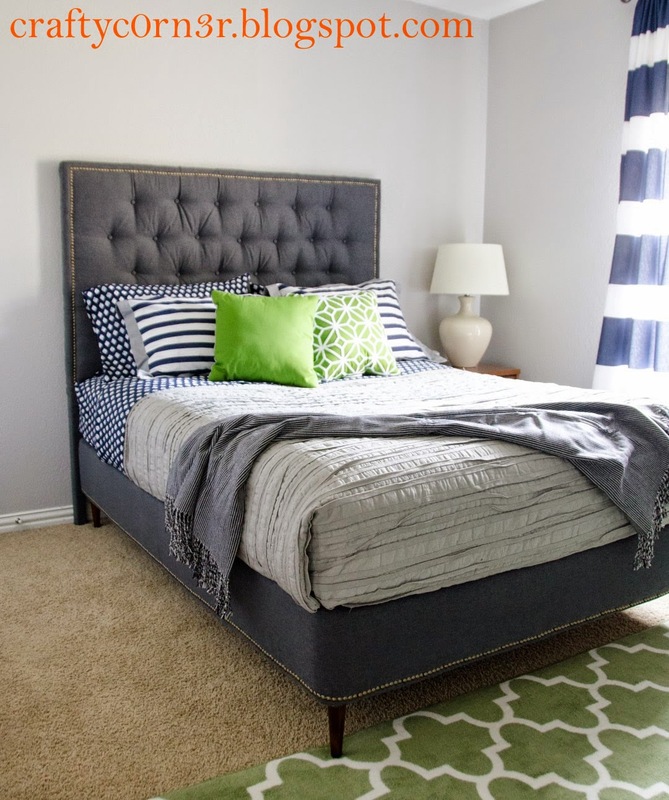 I think this is the best looking diy bed/headboard combo I've come across yet. 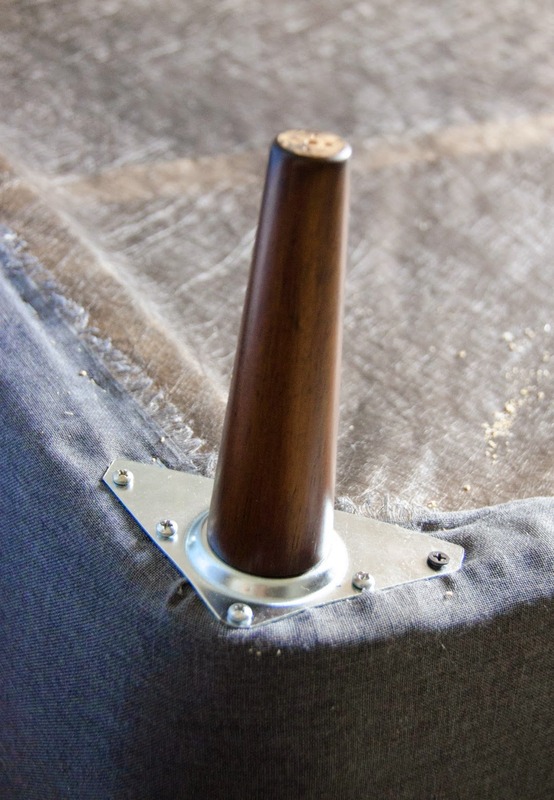 How do you get the heaboard to attach to the boxspring though since there isn't a frame/brackets? Thank you! Thank you very much! I think I've answered your question. Please look at comment right after this one. 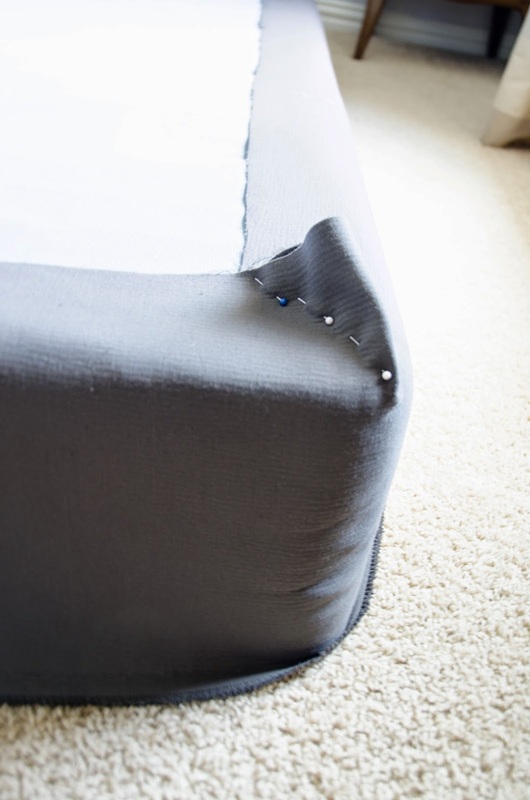 Okay I don't know why my comment keeps disappearing, but I wanted to know how you attach the headboard because the only way I see how is to attach it to the wall or just pushing the bed up to it and hoping it wont fall. Yes, you are correct. For this particular bed (because the mattress and boxspring combined are so high), I do not have the headboard connected to the bed. It is pushed to the wall by the mattress and boxspring. Since my mattress height is half the height of the headboard, it hasn't budged. If you are worried, I have also used brackets before. You can buy them at any hardware store or even at target where you hang one horizontal bracket on the wall and another on the headboard. The headboard would then "hang" on the bracket attached to the wall. 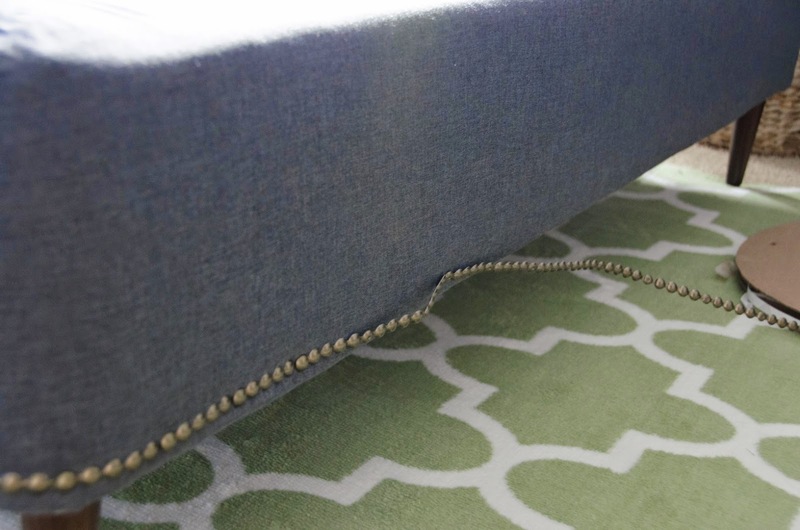 That would be a more secure way to fasten the headboard to the wall if you could not attach it to a frame. Sorry, re-submitting the comment so i can click on the notify me button! 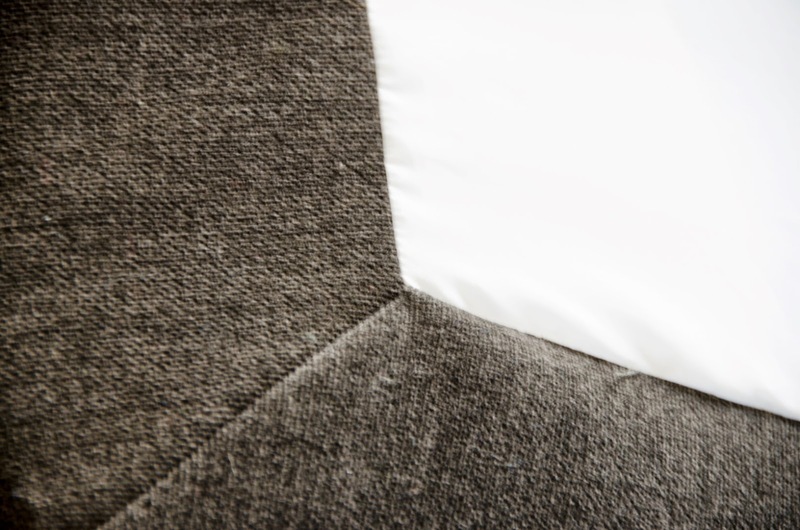 The amount of fabric would depend on the size of the bed and the width of the fabric. I believe that I was able to get by using 3.5 yards of a 60" fabric for this queen size bed. 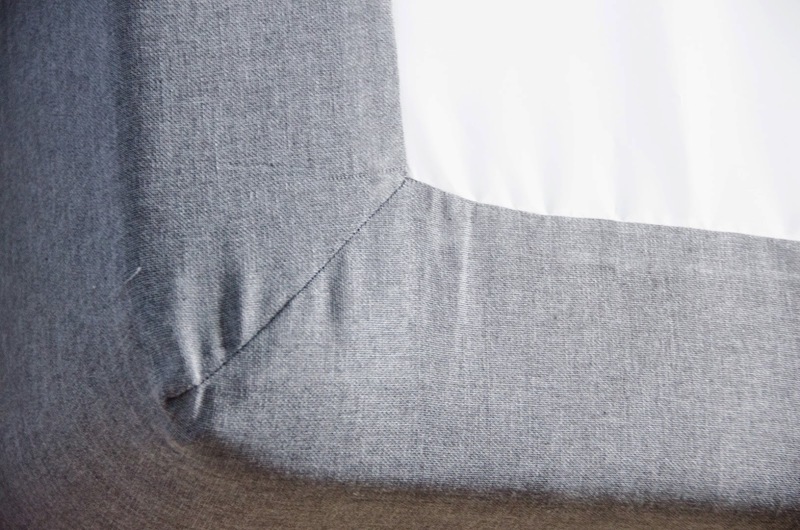 Since I used so little fabric, there were 2 seams on the left and right sides of the bed. 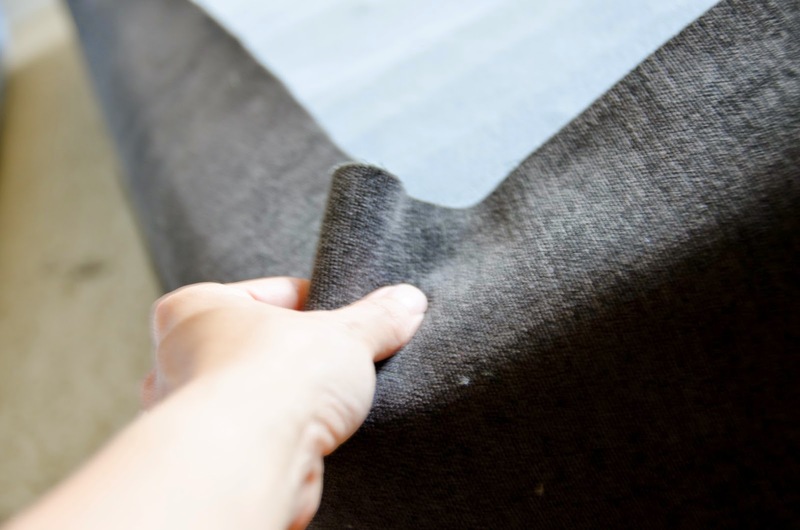 If you had more yardage, you could wrap the entire box spring without cutting a seam. 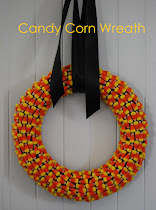 This would require a lot more fabric. I don't recall how much though. Since it is one piece, you could get a measuring tape and go around the bed. 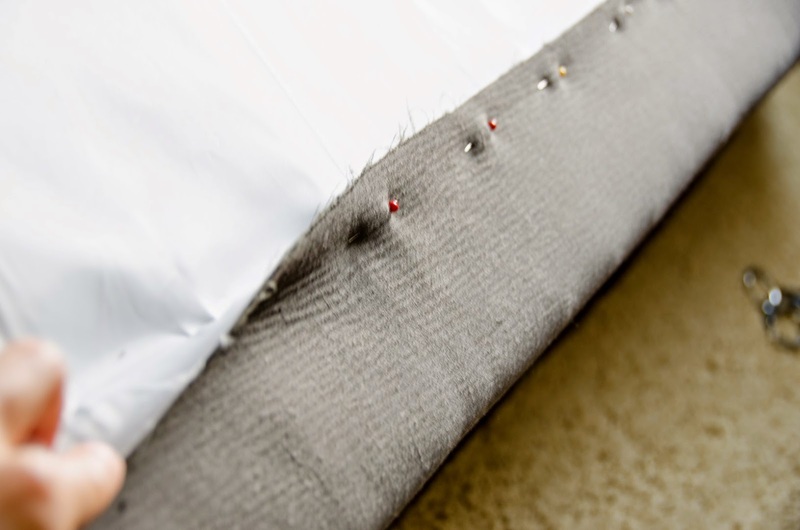 The length of the circumference of the bed plus a couple of inches for sewing would give you how much you would need. For Canadians these legs are the cheapest that home depot has same color and dimension $2.85 each. The plates are $5 each. Just so everyone knows where to buy them. I'm trying to copy love the how the bed turned out! I have a king bed with split box springs. How can I acheive this same option? That's a good question because I am thinking of doing it for my king bed. How I plan on attacking it is either using the metal bed frame that I already have and removing the 4 legs that support that (keeping the center legs). 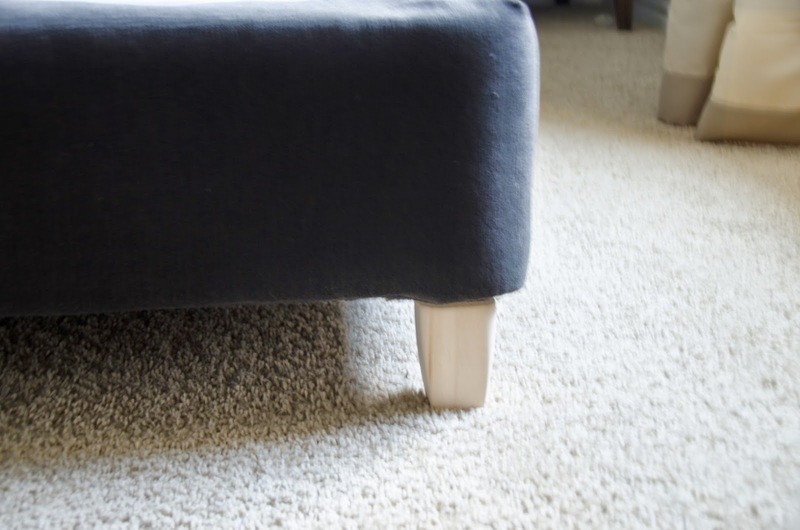 I would cover over the metal so it wouldn't be seen and then place the wood legs strategically on the wood frame if possible. That's my theory. If that doesn't work, I would build a wooden frame under the two boxsprings to support it before attaching the legs. Of course, these are all theories and I'm not an expert, but that is how I plan on attacking this problem.